Historical Background of the Book. As predicted by the prophet Nahum, the Assyrian capital city of Nineveh had fallen to the expanding Babylonian empire around 612 B.C. During this time, King Josiah finished his reign in Judah around 609 B.C. (2 Kings 22). He was initially replaced in rapid succession first by Jehoahaz and then by Jehoiakim who ruled from 609 B.C. to about 602 B.C. During his reign, the Babylonians first invaded Judah in 606 B.C. and carried some Jews into captivity. 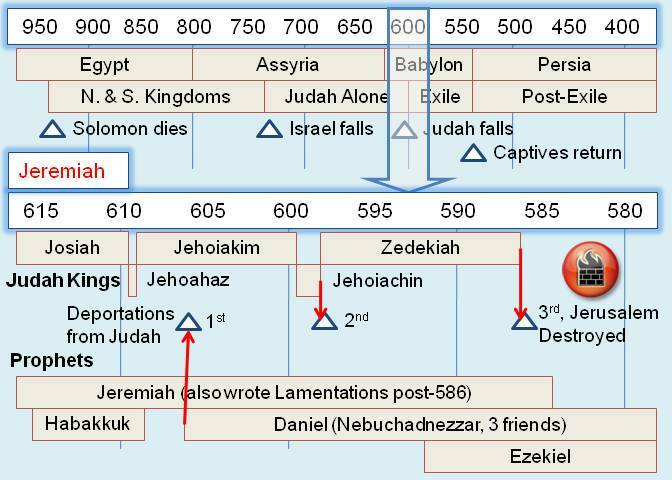 Very shortly, Jehoiakim would rebel against the Babylonians and be replaced by Jehoiachin around 598 B.C. In turn, Jehoiachin rebelled, the Babylonians again invaded the land, confiscated most of the treasures from the temple, carried most of the Jews into captivity in Babylonian territory, and installed Zedekiah as King. After about 10 years, Zedekiah also rebelled which resulted in the third deportation of Jews, an 18 month siege of Jerusalem, and the destruction of the city in 586 B.C. (2 Kings 25). Solomon's temple, which had existed for about 360 years, was destroyed along with the city. The Author and the Audience. From roughly 40 years between 627 B.C. and 585 B.C., the prophet Jeremiah was called to warn Judah of their pending destruction by the Babylonians. He was from a priestly family who lived in the land of Benjamin. According to Ch. 1:7 and 16:2, God called him as a young man and later instructed him not to marry. As a result of his faithful proclamation of God's warnings, he was beaten (Ch. 20:2), imprisoned (Ch. 32), thrown into a muddy cistern (Ch. 38), and threatened with death. Although Jeremiah addressed various nations (Ch. 45-51), his primary audience was the Southern Kingdom of Judah. Their rebellion to God was reflected in a wide variety of sins, including worshiping Baal and the "Queen of Heaven", sacrificing their children to the god Molech, murder, greed, lying, and breaking the Sabbath. They also had false prophets who contradicted Jeremiah, reassuring the people that all was well with God who would protect them from the Babylonians. Outline/Major Themes. The book of Jeremiah is written in an interesting combination of historical narrative, "Thus saith the Lord" messages, and various symbolic events used by God to illustrate some particular truth. These events include a broken pot (Ch. 19), two baskets of figs (Ch. 24), a yoke on Jeremiah's neck (Ch. 27), a release of Hebrew servants (Ch. 34), and a test of the Rechabites' faith (Ch. 35). The seriousness of adultery in the marriage relationship - God used the term "marriage" to characterize His close relationship with the nation of Israel. He also describes their rejection of Him for false gods as spiritual "adultery". The same God who hates divorce (Mal. 2:16) divorced Israel for her infidelity (Jer. 3:6-10). Such is the seriousness of adultery. See Matt. 19:3-12. Religious compromise associated with moral apostasy - The religious adultery of the Jews was associated with all manner of other sins. We see a similar pattern with Gentile nations in Rom. 1 along with warnings for Christians in 2 Tim. 2:16; 3:13; and 4:1-4. The blessings of the coming Messiah and the new covenant - Compare Jer. 31:31-34 with Acts 2. The punishment awaiting the wicked - In Jeremiah's day, the Hinnom valley east of the city of Jerusalem was infamous for the offering of children in fiery sacrifice to Baal and Molech (Lev. 20:2-5; 2 Kings 23:10; Jer. 7:31-32; Jer. 19:2, 6; Jer. 32:35). Jeremiah prophesied it would become known as the Valley of Slaughter due to the number of bodies buried there after the Babylonian conquest of the city. 600 years in the future the valley had become the city dump with refuse, decay, worms, and smoldering fires. Known then in the Greek language as "Gehenna", Jesus of Nazareth compared it to the eternal dwelling place of the lost (Matt. 8:12; 13:42; 22:13; 23:33; 25:30).